Iris and I went to the electronics district in Tokyo, the famed Akihabara. You ever see a movie where the characters visit a sketchy market of cramped alleys and exotic goods? 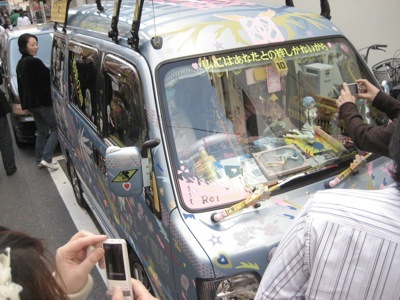 Well, Akihabara would be the place to stage that scene if the characters were nerds into ham radio and action figures. We found 6 stories of model kits and action figures of animation school girls, five by five stalls selling vintage tube amplifiers and high-tech Xmas lights, and a pornographic DVD store catering to any and all of your dirty needs. You want cellphones that do everything except work anywhere else but Japan? Easy. You want an electronic gizmo for a bike? Yeah, I found it. Not in a store, but rolling through the crowds of shoppers in the street. I saw this guy in full kit riding, which did seem to stand out a bit in this neighborhood. 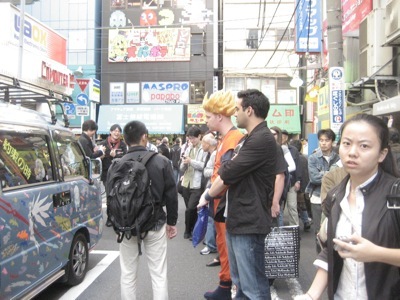 However, not as much as the crazy white guy in full anime costume proudly showing his super-geek van. But then I did a double take and had to chase the rider down. 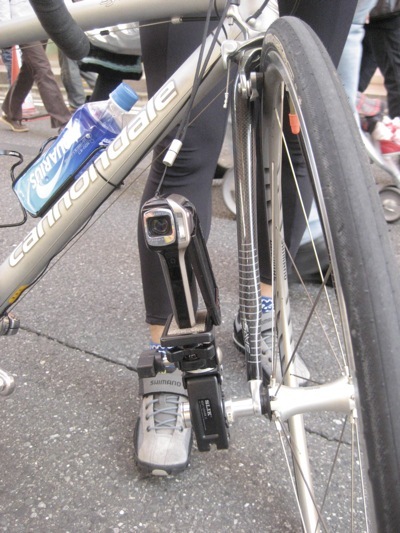 Mounted to his front axle, he had a small, handheld camcorder. 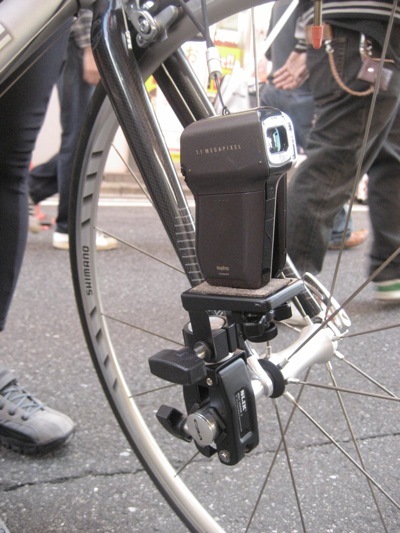 The camcorder seemed to be connected with the combination of a commercially-produced camera mount and maybe a Nitto-type headlight bracket that replaces the nut of a quick release skewer. He has a long leash on the camcorder, maybe for security, maybe for stability. I’ve never seen anything like this in use, but I’m intrigued. I’m thinking it helps that the camcorder is really small and relativlely light weight. Next Next post: From Taiwan: strange bike in a strange land.